Photo: B & B Rare Books, Ltd. A 1941 First Edition of The Last Tycoon. Value: $4,000. If one book could ever be “like” another, I should say it is more “like” The Great Gatsby than any other of my books. But I hope it will be entirely different—I hope it will be something new, arouse new emotions, perhaps even a new way of looking at certain phenomena. 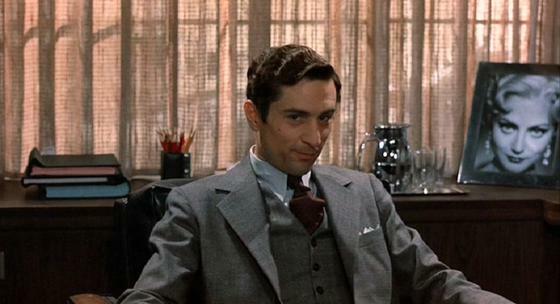 Robert De Niro as Monroe Stahr in The Last Tycoon (1976). Afterwards Stahr told me that he prepared for the meeting by running off the Russian Revolutionary films that he had in his film library at home. He also ran off Doctor Caligari and Salvador Dali’s Le Chien Andalou, possibly suspecting that they had a bearing on the matter. He had been startled by the Russian films back in the twenties, and on Wylie White’s suggestion he had the script department get him up a two-page “treatment” of the Communist Manifesto. 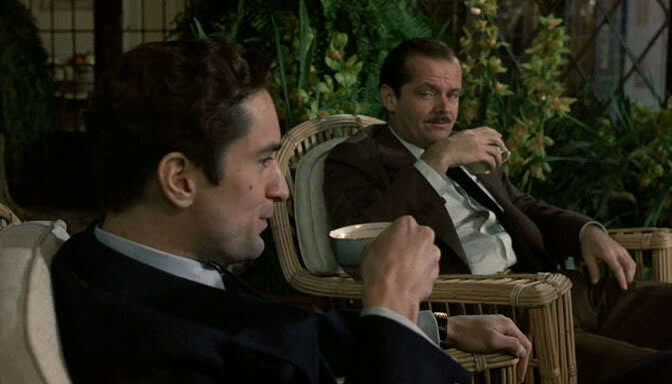 Robert De Niro and Jack Nicholson in The Last Tycoon (1976). Elia Kazan’s 1976 film of The Last Tycoon never quite catches fire, but it’s a fascinating attempt nonetheless, in its Harold Pinter script (remarkably faithful to the more polished sections of the novel), and many of the performances, especially Robert De Niro’s elusive and darkly internalized portrayal of Monroe Stahr. A notorious flop when released, the movie ended Elia Kazan’s directing career. Kazan devotes seventeen painful pages to the making of the film in his 1988 autobiography, A Life. He was dealing with his mother’s failing health and, finally, her death, during production. Moreover, there were clashes with producer Sam Spiegel. The film deserves reevaluation. It’s never revived or talked about anymore. There’s a strong and richly amusing climactic scene with Jack Nicholson as Brimmer, the novel’s communist union organizer, playing a spirited match of Ping-Pong with De Niro’s Stahr. It’s taken nearly verbatim from the novel and it’s a highlight of the movie. Kazan’s film would make for a great double feature with Last Call, a surprisingly eloquent 2002 Showtime movie based on Francis Kroll Ring’s memoir about working for Fitzgerald during his final days in Hollywood writing The Last Tycoon.